Melt your eye bags in just 10 minutes with minimal down time. Our eyes are our most important facial feature! Unfortunately our eyes are the first area of the face to show signs of aging. Fine lines and crow’s feet can start to show in our late 20’s and early 30’s. Puffy eyes, bags under eyes and dark circles can also appear early. 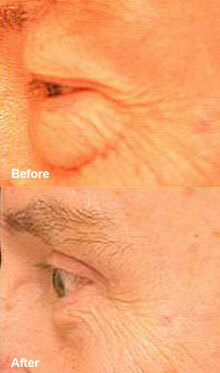 Aging changes in the skin cause the eyelid skin to lose elasticity and sag. As the eyelid begins to loosen, normal fat that lies beneath the eyeball pushes forward against the lower eyelid and creates a bulge or eye bag or puffy eye. A shadow forms beneath the protruding puffy eyelid and creates a dark circle beneath the lower eyelid. We inherit our eyelid structure, so if one or both parents have bags under the eyes, then you are prone to develop eye bags. 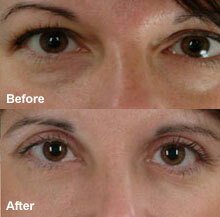 We use laser lipolysis fibre for laser blepharoplasty. The fat pads underneath your lower eyelids can be removed gently with a fine laser fibre and subsequent skin tightening would be achieved in the next 4 to 6 weeks. Local anaesthetic is used to numb the eye bag. The laser fibre is inserted in the bag via a small entry. The laser beam melts the fat. The procedure is painless. You may expect some bruising and swelling for 2-14 days. The benefit of this procedure is avoidance of potential serious consequences of surgical lower eyelid correction. Eyelid rejuvenation techniques to cure puffy eyes work well when you are younger and when puffy eyes, bags under eyes and dark circles are just starting to show. As we grow older and eyelid aging progresses, more permanent changes such as loose skin and wrinkles are harder to correct and may require more complex surgery including skin removal and eyelid tightening called a canthopexy.